Relatively quick and easy dish to prepare. The Cod can be substituted by the fish of your choice. Heat half the oil in a pan over medium heat, then add the shallots and cook for 2 – 3 minutes until slightly translucent. Add the breadcrumbs, lemon zest and juice and chopped herbs. Combine with a wooden spoon. If you find the breadcrumb mixture is a little dry you can add some extra oil. Holding the fish fillet skin side down in one hand, scoop the breadcrumb mixture onto the fish, then press firmly onto the flesh. Lay the fillet onto a parchment lined baking tray and season with some salt and pepper. 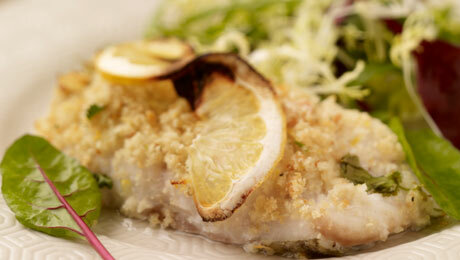 Place the cod in a preheated oven for 12-15 minutes. The cod will be ready when it flakes apart when squeezed between your fingers. Serve immediately with dressing and some salad leaves.